You know when we see a hot girl/guy and gush about her/him to our friend sitting next to us, whispering, “She/He should so totally be a model!” What thought runs through our mind at that exact moment? What makes us decide, in that moment, that a pretty, skinny, tall, handsome person ‘should be a model’? Is it because we truly, innately believe that attractiveness must be promoted and shown to the public? Or is it our unconscious, submerged in the shallow puddle of a standardized, lookism society? Above is THE controversial mugshot photo that people are going crazy over. 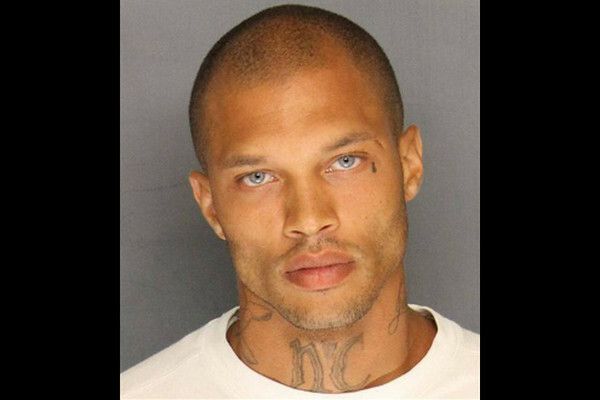 For those of you that haven’t yet heard what the fuss is all about, here’s the story: Jeremy Meeks, a former gangbanger and convict of a number of other charges(grand theft, felon possession of a firearm, and more in the past), recently shot to fame after his mugshot(image above), which was posted on a police Facebook page, attracted the attention of social media. At the time, the photo had over 100,000 likes(which means it has even more now). Meeks is currently still behind bars, but women all over the world are raising money and supporting his bail for the one reason that he is HOT. He has also landed a modelling contract with Blaze Modelz, a modelling agency based in L.A. Tom Ford has also signed a contract with the felon for him to appear at court wearing a Tom Ford suit and tie. The disturbing thing about this story is the extent to which people judge based on looks. It’s sickening to think that one would actively donate money(which could have been used to help buy food for people living in poverty) to get someone out of jail-not because they logically think that he is innocent-but just because he is attractive. However, what’s even more disturbing is the fact that modelling agencies and high-fashion brands are approaching him, offering him modelling contracts. Well obviously it is a well known fact that most models are ‘attractive’ according to social standards, but this whole craze makes me question the essence of being a fashion model. Is modelling solely about fame and good looks? I really enjoyed watching Season(Cycle)20 of the famous TV show America’s Next Top Model, and although most of the contestants tend to be physically attractive, I remember that at the end of the day the final judgement was made based not on looks but on true talent, ‘talent’ being possessing the traits/skills(spontaneity and creative response to unexpected situations, posture, confidence, understanding of one’s own physical features, passion for fashion, etc.) that are required to be a good model. This is one of the reasons why I enjoyed the show. But apparently in the real fashion world people can just get hired as a model(despite the fact that a whole nation-worthy number of people are in line, working their butts off to become a model) for looking good and taking a good mugshot. Can a single mugshot really ooze ‘fashion model potential’? Is being ‘hot’ a direct ticket to a new career in the path of high-fashion? Here’s another example of someone becoming a model after becoming internet-famous for their looks. She filmed a hair tutorial, then had that modelling contract in her hands until it was snatched away because of a photo of her posing with a gun and a dead animal that she killed on a hunting trip. With the photo she wrote the caption, ‘Hunting is not a matter of life or death. It’s much more than that..this was about 1 year ago…ready to hunt americans today haha : P ‘ Fans were outraged and L’Oreal announced that her contract was ‘completed’. What I’m trying to say through this story is, is an attractive photo and internet fame all that it takes to become a model? Of course, companies seek profit by hiring trending figures to represent their brand, but what does this mean to the meaning and definition of being a model? Is a model just a pretty face? The ‘digital age’ was brought upon us many conveniences but at the same time also took away and degraded some of our values, one of them being the genuine artistic essence of modelling(which, for a healthy society, should be anything but just looks and fame). Because of this, we’re experiencing an era where young women are starving themselves to get perfectly flat stomachs and a gap between their thighs, where boys exercise just to get those ripped abs that they see on TV commercials. We’re experiencing an era where being yourself and looking different from the social norm is unacceptable, because we’re forced to standardize looks and fall into the trap of lookism that we’re making for ourselves. To comment or like this post, just click the title of this post, then scroll down. You’ll see the comment box and like button at the bottom of the post. I don’t know who he could be or might be but I know it has been because the shadow of death is in his eyes. Anyway the reason I came by was to say thank you for reading my work and now that I’ve visited thanks for sharing your thoughts because they’re the kind of thoughts it always reminds me I want my heart is thinking and why. Thanks for stopping by Alexander! Thanks again for reading my posts. Have a wonderful day. I think the reason people look at attractiveness as an indicator of one’s personality and ability stems back to evolution. We had to make split-second decisions about trusting another and their appearance was what we first saw. It was used to signify if that person was healthy and a suitable mate. However, in modern day society it has become a cause of conflict and biases. Those who are considered good-looking and have been born from generations of successful reproduction have a higher rate of prosperity in life. Others who are not as fortunate end up with low self-confidence and are often undervalued by others and themselves. This is a point I’m aware of and have even written as essay on. I was trying to suggest having added a counter-argument to your post. Cool. I’m sorry if I came off as aggressive; I have a tendency to debate with everyone(my mother is always scolding me for it-I should try to change that about myself!). I really don’t mean any harm! : ) Thanks so much for taking the time to read my post and for leaving an insightful comment. Have a great day! The deeper parts of our being can appreciate beauty in many facets and forms, but the temporal part of people seems most often drawn to temporal beauty. One of my kids does professional modeling, and it disturbs me to read comments that diminish unique value to little more than an appetizing plate of dinner. I doubt this part of humanity will evolve or change. It seems to be what it’s always been, only now has the aid of modern technology to disseminate and promote it.